Cadboro Bay to Mary Tod I. This week I did some calculations before the trip to make sure my navigations skills weren't totally wrong. I made up a couple of handy worksheets to figure out the time and the weather and then went up to see how they worked in the actual ocean. I got to the beach and was greeted by Paula and Bernie. Just as I got my kayak to the beach John showed up and the group was 4. The forecast was light wind from the northeast, an outgoing high tide and an ebbing current in the Baynes Channel, which maxed out at 3.9kts @ 2:30PDT. So far I was right about the tide, but the weather forecast was wrong. The wind was southeasterly, but still light. We launched from the beach and headed to the east and along the shoreline to flower island. We made our way around the narrow passages and out to Jemmy Jones Island where we could see Baynes channel, The current was already well on the ebb at 11:45. 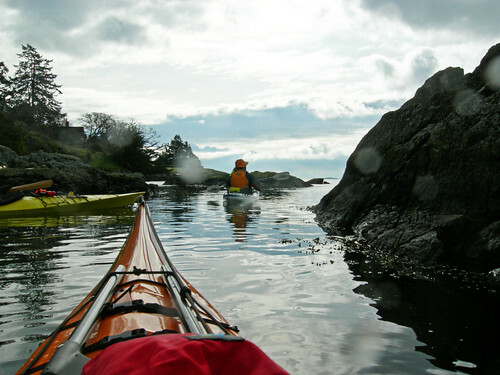 We decided it would be prudent to stay out of Baynes Channel and paddle toward Mary Tod Island. We played around in fiddle reef and noticed we were being pulled south by a lazy current. We headed out of the channel and noticed more and more confused water bubbling up around us. Once we were at Mary Tod, Bernie got out and adjusted his pegs and we were back on our way to the take out. 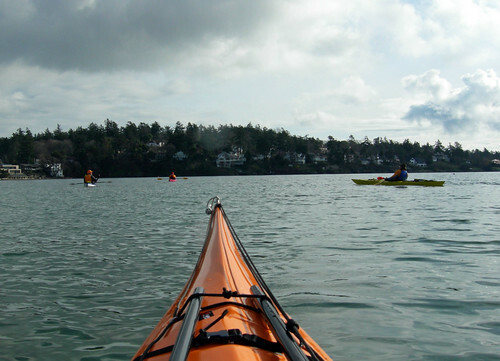 We were fighting a small current along the shoreline until we entered Cadboro bay. Once in the bay, the water was free of current but was being chopped up a bit by the wind that was blowing directly against the outgoing tide. 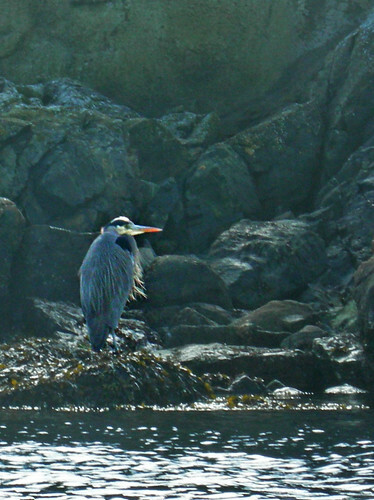 We caught glimpses of all kinds of bird life on the shores - we were greeted by a bald eagle and a number of cormorants as well as the great blue heron above. I followed Bernie's pace back to the beach double time using the last few hundred meters to feel the speed of a tailwind and a strong forward stroke. Felt good!